House Minority Leader Ken Fredette, R-Newport, gestures during a debate in the House of Representatives on April 8, 2014. 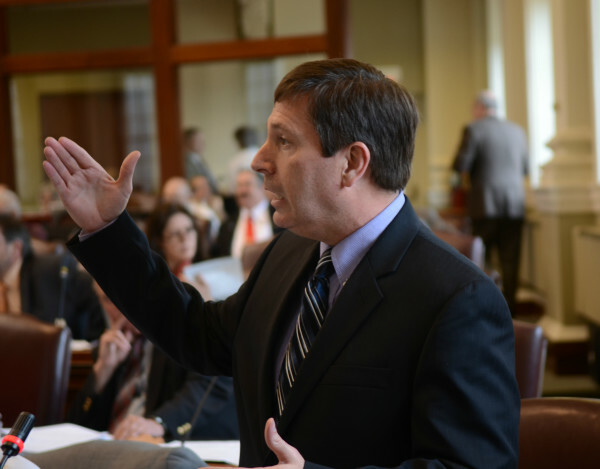 AUGUSTA, Maine — The rift between Republican leaders in the Maine House and Senate continued to grow Tuesday, with dueling accounts about how negotiations on the state budget have created a split between Republicans in each chamber. Fredette responded with incredulity that Republicans in the Senate would make such a claim because, according to Fredette, they didn’t reveal to him or any of the House Republicans on the Appropriations Committee that they had hatched a budget deal with Democrats until after noon Sunday. The deal includes a promise from Democrats that they will support a constitutional amendment that requires a two-thirds vote of the Legislature to enact any income tax increase. Fredette told reporters during a news conference at the State House on Monday and again on radio program Tuesday morning that he has been shut out of negotiations on the biennial state budget. Neither Fredette nor Saviello serve on the budget-writing Appropriations Committee, but as House minority leader Fredette regularly consults with the four Republican House members on the panel. Saviello supported his version of events by providing the BDN with printouts of text messages and lists of times Saturday and Sunday that Fredette and other House members were contacted but didn’t respond. One text from Mason to his chief of staff, Diane Johanson, appears to show Fredette had pulled House Republicans out of negotiations. Fredette said his caucus’ position on the budget has never been in question. He reiterated Tuesday that House Republicans wouldn’t support a budget that doesn’t include income tax cuts, welfare reform and spending reductions. He said in addition to the meeting GOP leaders had with LePage on Thursday, he had a face-to-face conversation Saturday with Thibodeau, in which Thibodeau made no mention of the budget deal with Democrats. Fredette has been leading an effort to undermine the direction Senate Republicans and Democrats in leadership and on the Appropriations Committee are taking on the budget. He has said he has enough support in his caucus to block a two-thirds vote in favor of the budget, which is required because of how close it is to the end of the fiscal year June 30. It would take 18 House Republicans voting with all Democrats and the five House independents to achieve a two-thirds vote. This degree of bitter disagreement among members of a single party is a rare spectacle in Maine, but LePage and his supporters also are joining in. LePage has said he’ll campaign against Republicans in 2016 if they don’t follow his lead on tax reform, and a political action committee run by his daughter, Lauren LePage, weighed in with a series of robocalls Monday evening and an email Tuesday, including criticism of Thibodeau and Mason. LePage was scheduled to hold a town hall-style meeting Tuesday evening in Lisbon, which is Mason’s district.